I have been practicing meditation since the mid-70’s and started a mindfulness meditation practice in the mid-90’s. Mindfulness has to do with the quality of awareness that we bring to what we are doing and experiencing, to being in the here and now. It has to do with learning to focus on being in the present, to focusing our attention on what we are doing and what is happening in the present. Many of us are distracted by images, thoughts and feelings of the past, perhaps dissociating, worrying about the future, negative moods and anxieties about the present. It’s hard to put these thing away and concentrate on the task at hand. Mindfulness has to do with states of mind. Reason Mind, Emotion Mind, and Wise Mind. Reason Mind is your rational, thinking, logical mind. It plans and evaluates things logically. It is your “cool” part. Reasonable Mind can be very beneficial. It is easier to be in Reasonable Mind when you feel good. It is much harder to be in Reasonable Mind when you don’t feel good. Emotion Mind describes times when emotions are what influence or control your thinking and behavior. Emotional Mind can also be very beneficial. Emotions are what motivate us to action. Emotions are what keep us attached to others and building relationships. Illness, Lack Of Sleep, Tiredness, Drugs, Alcohol, Hungry, Overeating, Poor nutrition and/or lack of exercise, Environmental stress and threats, not taking your meds. Reasonable mind gives you a way to solve your problems. Emotion mind gives you a reason (motivation) to want to solve them. Wise Mind is the integration of emotional and reasonable mind. Wise mind is that part of each person that can know and experience truth. It is where the person knows something to be true or valid. It is where the person knows something in a centered (balanced) way. It is almost always quiet and calm in this part of the mind. Everyone Has A Wise Mind! Some people have simply never experienced it. No one is in Wise Mind all of the time. Wise Mind – An Analogy for Wise Mind is like a deep well in the ground. The water is at the bottom of the well. The entire underground is an ocean called Wise Mind. But on the way down, there are often trap doors that stop progress. Sometimes the trap doors are so cleverly built that you actually believe that there is no water at the bottom of the well. The trap door may look like the bottom of the well. Perhaps it is locked and you need a key. Perhaps it is nailed shut and you need a hammer. Perhaps it is glued shut and you need a chisel. Nathan Allen loves the colour blue. His T-shirt is blue, the blanket wrapped around his knees is blue, and his eyes, bright under his baseball cap, are blue. But blue is also a feeling, and after spending months undergoing near-daily dialysis at the Hospital for Sick Children, who could blame an 11-year-old for feeling a bit down? Nathan was referred to the hospital’s new on-staff art therapist to help him cope with his emotions. And when Jennifer Bassin came to visit recently week with her case of supplies, he chose the colour blue to start on a sculpture of a car. “Shocking,” jokes his mom, Judy Chapman. Nathan was diagnosed with a bilateral Wilms’ tumour, a rare cancer of the kidneys mostly affecting children, at age 5. He started chemo and radiation and had a partial nephrectomy in both kidneys. His left kidney never worked properly again, and after almost five years of remission, cancer returned to his right kidney. Now he undergoes chemo once every three weeks and dialysis five days a week. That’s a lot of poking and prodding for an 11-year-old who would prefer to be playing defence on the Georgina Blaze novice hockey team and cuddling his 3-year-old beagle, Daisy, at home in Keswick, Ont. After three more chemo treatments, Nathan can go home. His parents are training to do at-home dialysis and counting down the days until Nathan can receive a new kidney. His mom is praying she can eventually donate one of her own. Until then, he looks forward to his weekly sessions with Bassin. She visits during the two-and-a-half-hour dialysis process, and they paint or sculpt while the machine whirs in the background. Bassin has brought something called a 3Doodler — a cross between a hot glue gun and a tiny 3D printer, which can make plastic sculptures. This day, after he makes the car, she asks Nathan to make something that resembles his idea of cancer. “A big, black, blob,” he says. Nathan is an outpatient but most of Bassin’s patients are long-term in-patients at Sick Kids who have chronic illnesses, complex medical histories or have faced traumatic injuries. Since the program started in May, she does art therapy just two days a week and sees between four and eight children aged 4 to 18. Psychiatric patients have benefited from art therapy at Sick Kids in the past, but this is the first year the new program, which is entirely funded by donations, has been extended to medical patients. One patient, who had recently been in a traumatic boat accident, sculpted a vessel out of clay — and then smashed it against the wall in a moment of catharsis. Some enjoy the physicality of painting big murals, and some like to rip up what they’ve drawn. Another drew a landscape so she could imagine herself outside the hospital, at a picnic. Making art helps young patients take back some control in their lives, if only for an hour. Some patients are content with their creation, and others want to delve deeper into their feelings, Bassin says. Nathan’s family hopes he can go home in late September, when he can rejoin his classmates in Grade 6 and go back to being an annoying older brother to his sister Emma, 7. He’s still quiet, but less withdrawn after a session, his mom says. As he paints a mask green, with blue lips and black eyes, Bassin asks Nathan if he has a plan. Creative Arts Therapists are human service professionals that help individuals, families, and groups improve their overall physical and mental health. They apply the principles and techniques of each art form in an effort to improve communications, allow expression of feelings, improve coordination, and increase cognitive and social function. Creative arts therapists sometimes specialize in a single area such as dance and movement therapy, drama therapy, art therapy, music therapy, or poetry therapy. They begin by interviewing patients and consulting other health professional to determine the psychotherapeutic needs of the patient. They then develop and implement a customized creative arts therapy program. They observe patients and maintain accurate records so they can consult with the rest of the therapeutic team, which may include physicians, psychologists, psychiatrists, nurses, counselors, and teachers. Creative arts therapists work with a variety of patients including those with learning disorders, emotional problems, mental retardation, substance abuse/dependency, and physical disabilities. They may also be called upon to conduct scientific research and teach students and other professionals the latest therapeutic methods. Do you have to be intelligent to be creative? Can you learn to be more creative? In this episode, we speak with neuropsychologist Rex E. Jung, PhD, who studies intelligence, creativity and brain function. He discusses why – even if it sounds counterintuitive – intelligence and creativity may not have all that much in common. Transcript of interview with Audrey and Rex Jung from the APA website. Rex Jung is an assistant professor of neurosurgery at the University of New Mexico and a practicing clinical neuropsychologist in Albuquerque. He studies both brain disease and what the brain does well – a field of research known as positive neuroscience. His research is designed to relate behavioral measures, including intelligence, personality and creativity to brain function and structure. He has published research articles across a wide-range of topics including traumatic brain injury, lupus, schizophrenia, intelligence and creativity. Welcome, Dr. Jung. Rex Jung: Thank you, Audrey. Audrey Hamilton: Could you first of all explain neuroimaging and tell our listeners how it helps researchers understand how people think and act? Rex Jung: Sure. So, neuroimaging is the tool that we use to measure the brain and there’s lots of different neuroimaging techniques. I use three main neuroimaging techniques – the first that I learned in graduate school was magnetic resonance microscopy, which sounds kind of complicated. But, it is a technique that basically looks at the chemicals in your brain. It’s in a standard MRI machine like you would go to get your knee scanned. But, using some sophisticated techniques you can look at certain chemicals in the brain. Some of those chemicals are very involved in important neuronal processes. And we’ve correlated those with behavior. A different technique is called diffusion tensor imaging, which allows us to look at water movement in the brain. And this is important because there’s lots of tubes going through your brain like the wires that connect up your computer to the Internet. And these tubes, called axons, are connecting up different processing modules of your brain and those have to be healthy. So, we can look at the health of those axons, those myelinated axons, the fatty sheath like the insulation that surrounds those tubes. The third technique that we use is just structural magnetic resonance imaging and that allows us to look at the processing modules of the brain – the cortical thickness – the computers that are on the surface of the brain and how much or little of that you have on the surface of the brain. Those are the three main techniques that I use. There’s functional imaging, fMRI, that most people have heard of where you’re looking a blood flow, as well. Those are ways that we measure brain structure and function and this gives us the ability to do scientific measures that then we can correlate to behavioral measures in psychology. Audrey Hamilton: Does being highly creative mean you’re also more intelligent? Rex Jung: Not necessarily. There’s a controversy about this in the psychological literature and some people have found correlations between creativity and intelligence. They’re usually pretty low, this association. And some people make a lot of that, this low association. But usually, because this association between creativity and intelligence is low, it means that you don’t necessarily have to be intelligent to be creative. So, I spent over a decade studying intelligence. It’s one of the reasons I started studying creativity because it seemed like something distinctly different and interesting than intelligence, which I have studied. I work with very highly intelligent people in academia and scientists and not all of them are creative. Why is that? If they do go together I would be working with all of the creative people in my city in Albuquerque, but that wasn’t the case so creativity seemed to be something different. Audrey Hamilton: Can a person learn to become more creative or simply gain intelligence? Rex Jung: There are some tools and techniques that can help people to be more creative. We’re starting to learn more about creativity and it’s one of the things that I’m excited about in terms of creativity is that there might be ways to increase your creative capacity. Intelligence unfortunately seems to be much more under tight genetic control. The genetic correlates of intelligence are high, like .75. So, if you have twins – they’re going to be identical twins – their correlation of their intelligence with one another is going to be very, very high. So that implies that the genetic involvement of that capacity is under much more tight control than the environment would be. With creativity, we don’t have that information and I’m hopeful that you can modulate or modify creative cognition much more than intelligence. There are studies out there that have shown increases in intelligence scores of two, maybe three points on a particular measure, which are not particularly high. But those are also controversial. Some have been replicated. Some haven’t been replicated. And we really don’t see that in terms of intelligence. With creativity, there’s a pitched effort to try to increase creativity scores on some of these measures and we’re seeing some good initial results and I’m very hopeful about that. Audrey Hamilton: How does the way a person’s brain works and is structured influence how creative or intelligent he or she is? Rex Jung: The research that we’ve done shows that the brain organization of intelligence and creativity are quite different. So, when you think about those measures that I talked about, those neuroimaging measures, the brain of someone who is intelligent – think of bigger, better, stronger, faster – all the measures are pointing to higher integrity of the brain of someone who has high intelligence. So, the cortical mantle is thicker, the white matter, the wires are more myelinated, the water can travel faster and in a coherent direction, you have more of these certain chemicals that I was talking about. Audrey Hamilton: It’s beefed up. Rex Jung: It’s beefed up, yes. So you can have a better organized brain. With creativity, the story was different. In different regions of the brain, we were seeing weaker connections, thinner cortex and different levels of these same biochemicals. So, it was really clear from these studies that intelligence and creativity were different because we were seeing different pictures in the measures we were taking of the brain. But I tend to look at creativity and intelligence as two different kinds of reasoning. That creativity is kind of reasoning without all of the information present. So, call it abductive reasoning. But, you have hypothesis testing about how the world could work without all of the information present. So, you have to use abstraction and metaphor and stuff like that about this might look like this or this might be this way. With intelligence, you’re using deductive reasoning, where it’s rule-based reasoning where a equals b and that’s the way it goes. You have a rule for how this relationship works. So, creativity and intelligence are probably different types of reasoning. Both are very adaptive, but they’re just different for different types of problems that you have to solve out in the world. Audrey Hamilton: Is real creativity rare? How about genius? Rex Jung: So, creativity is common and genius is a lot more rare than we would believe. The term genius gets thrown around a lot. But, I think genius is rare because that combination of brain organization where you have high fidelity, beefed up brain in certain regions and then kind of down regulated brain in other regions is really going to be kind of rare where that is present in the same brain. So, to have that back and forth between intelligence and creativity, the ability to do both of those reasoning processes well, where you can do first approximations, hypothesis testing, abstraction and then create a rule, a novel and useful rule out of nothing before is rare and that is true genius. Audrey Hamilton: Well great. Thank you so much for joining us, Dr. Jung. It’s been very, very interesting. Rex Jung: Great. Thank you, Audrey. 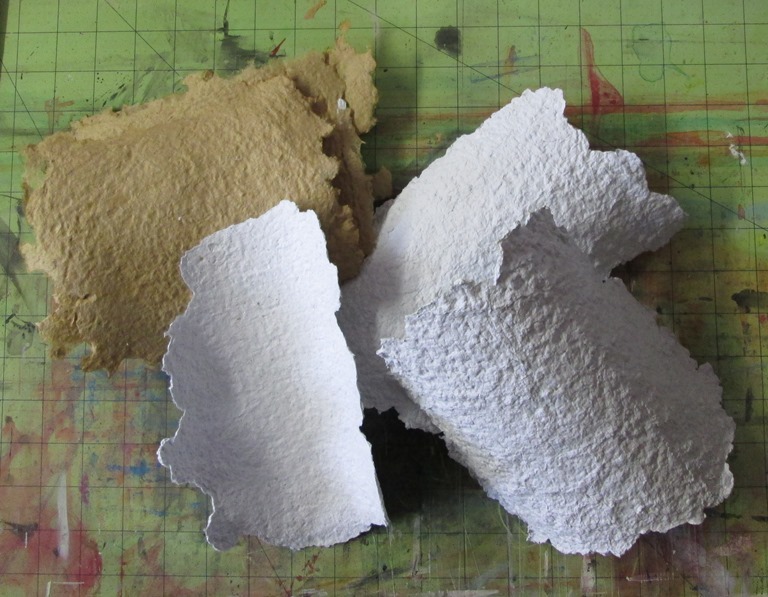 I have been making paper for quite a few years both with therapy groups and for my own enjoyment. 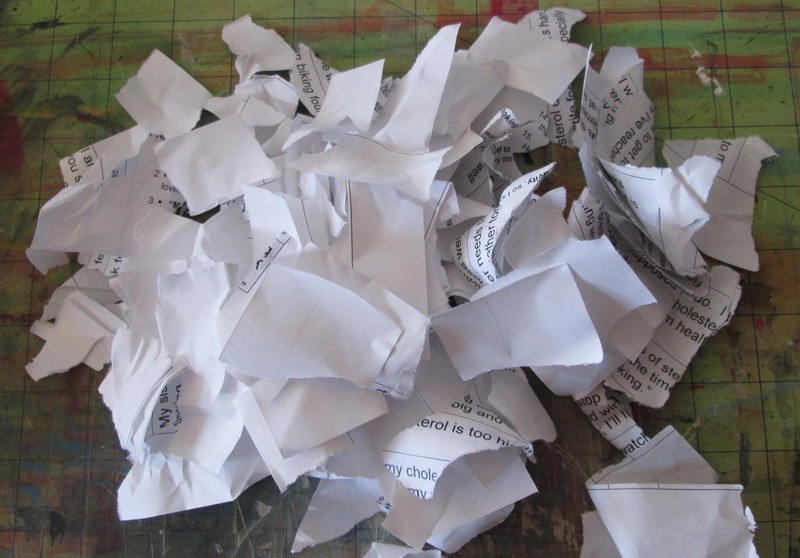 This particular batch was made up of recycled handouts that I cut and ripped up into roughly 1 x 1 inch pieces. 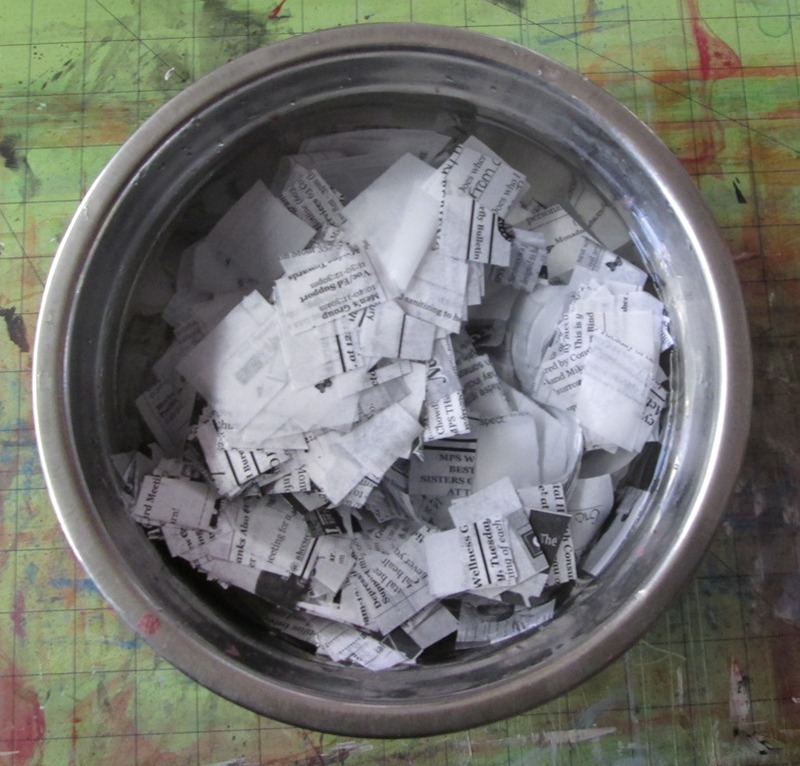 Next I used my trusty little blender to chop up the paper and turn it into pulp. 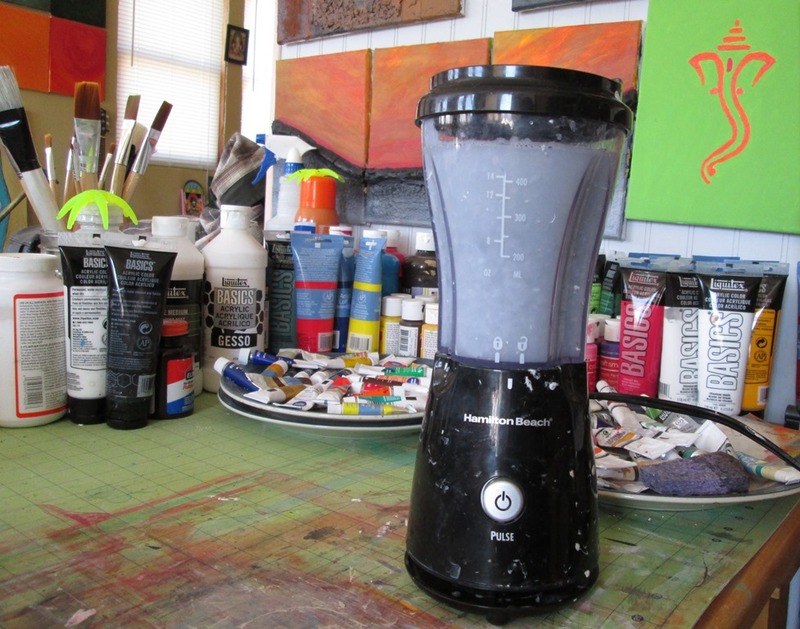 Instead of pouring the pulp into a tray of water and using a deckle to ‘fish’ the fibers on to a mold or frame I poured the pulp directly into a strainer, removed most of the water and than ‘sculpted’ the pulp around a cylinder form. The last photo is of some of the finished 1/2 cylinders and some brown craft paper that I also made that day using a regular deckle. According to the American Dance Therapy Association (ADTA): Based on the understanding that the body and mind are interrelated, dance/movement therapy (D/MT) is defined as the psychotherapeutic use of movement to further the emotional, cognitive, physical, and social integration of the individual. Dance/movement therapy is practiced in mental health, rehabilitation, medical, educational, and forensic settings, and in nursing homes, day care centers, disease prevention, and health promotion programs. The dance/movement therapist focuses on movement behavior as it emerges in the therapeutic relationship. Expressive, communicative, and adaptive behaviors are all considered for both group and individual treatment. Body movement as the core component of dance simultaneously provides the means of assessment and the mode of intervention for dance/movement therapy. I often define D/MT to clients as psychotherapy that is not limited to talking but encompasses the full range of human expression, including movement such as gestures and or postures, drawing, writing, drama, music and other expressions that can have a therapeutic benefit for the client(s).